After a hectic week of being busy, I’m finally back to my blogs! Below I’m posting an excerpt from my new book The Prince of Prophecy Vol. I: Destined! What to do? Destan thought as he aimlessly roamed the palace grounds. This sort of free time was a rare gift, thus Destan was not exactly sure what he should do with it. He could go down to the gardens, but Christof might still be there and he did not want to risk the possibility of having to return to his studies. Eventually, he decided to visit the Castle Ruins. Florian used to take him there all the time when he was younger, though nowadays he often visited this place on his own. The ruins, he found, were an excellent place to sit and think. It was quiet and tranquil compared to the chaos constantly going on inside the palace. These ruins were a part of the old Rosenstaat castle destroyed in a war with Thornholz over a century years ago. Even in its prime, Destan was sure it was not as grand as the palace he resided in now, but it was still so enchanting. Here, there were no servants and no advisors. It was just him and his thoughts. Ivy and morning glories grew wild and climbed the broken walls and deteriorating ceilings. Birds had made nests in vacant nooks where candelabras used to stand. The stone floor was covered in moss, and ferns grew through the cracks. But there were no wild flowers besides the monotonous blue of the morning glories. Destan figured there was not enough light for flowers to grow within the ruins and there would not be until the ceilings finished crumbling. Normally, he was not allowed to come here unattended in case a piece of ceiling fell and hit him on the head or he tripped over the mounds of debris. Despite the dangers of going there alone, it seemed that any free time he had was spent here. He gravitated toward this lonesome dank place, yet he did not know why. Maybe it was curiosity that brought him back time and time again. 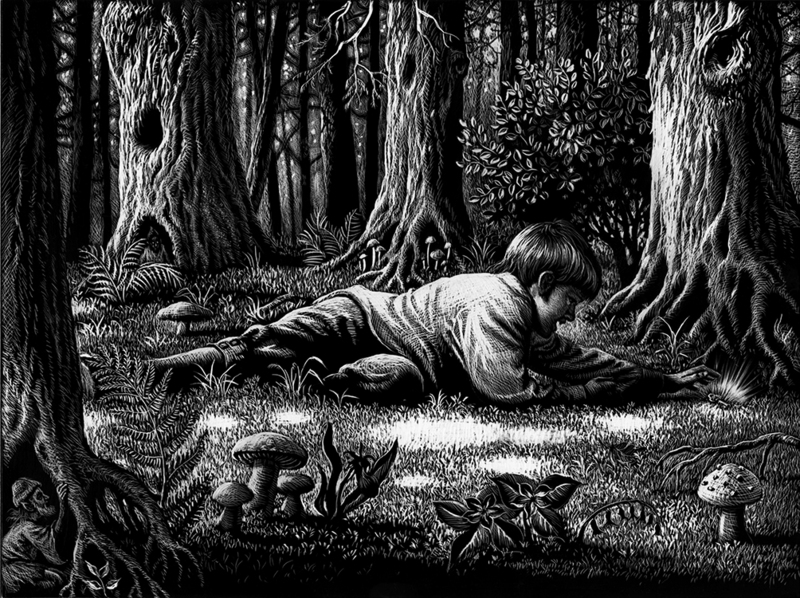 His eyes scoured the ground for anything that could satisfy his curiosity. Pieces of a broken mirror? No. A tarnished candelabra? No. A deteriorating tapestry? No. None of these things were what he was searching for. Destan sighed and leaned against the stone wall, crossing his arms over his chest as his eyes continued to scan the abandoned hall for…something. He was not quite sure what exactly he was searching for, but he knew that it was here. He felt it. However, no matter how many times he had searched this place he found nothing that satisfied his curiosity. So he continued to return, again and again, searching for something he knew was there. He was beginning to think that this feeling – this need to find whatever these ruins were hiding – was merely his imagination running away with him again. There were no such things as real adventures with dragons, damsels in distress, and valiant heroes that always saved the day. This was real life, and there was nothing magical or mysterious about his. Who was he kidding? There was nothing for him to find in these ruins. Destan set his jaw and, just as he was about to storm from the ruins, he heard the distinct sound of stone sliding against stone. It did not take him long to realized that the wall he was leaning against was falling backwards! He leapt away from the wall and spun around to face it, expecting to see the stone collapsing and dust rising, but he was wrong. The wall was perfectly intact, pushed back a bit now to reveal a dark passageway. His eyes widened with surprise, as his heart pounded against his chest. The prince took a few cautious steps toward the opening and peered inside. He waited for a moment as his eyes to adjust to the darkness inside the passage, but still he could not see what lay beyond the entrance. Yes. This was what had drawn him there, he was certain of it now. He delicately pushed back the curtain of ivy that hung in front of the passageway and stepped inside. His nose crinkled as the smell of musty, stagnant air pervaded his nostrils. This place had not been visited in some time, of that he was certain. He must have been the first person inside this secret space since the castle’s destruction. The prince’s feet moved on their own, his fingertips dragging along the wall as guides as he moved farther into the pitch-black passageway. The faint forms of torches mounted upon the mossy stone walls became visible, as did the outline of a door at the end of the narrow passage. The sound of his footsteps echoed so loudly in the small space, the prince feared the vibrations of which would cause the deteriorating ceiling to collapse on top of him. Destan slowed his steps, trying his best not to disturb the decaying castle any more than he had to. When he finally reached the end of the hall, he inspected the door for any sort of traps which may have been placed there to protect the room’s contents. After a thorough search of the door as well as the area around it, he concluded that the door was safe to open. Once the initial moment of hesitation had passed, Destan reached out and carefully turned the knob. He pushed the door open and entered the dark room beyond. Immediately, the overpowering scent of roses almost sent him stumbling back out. He squinted his eyes, trying to make out where the scent was coming from, but, as far as he could see, there were no roses inside the chamber. 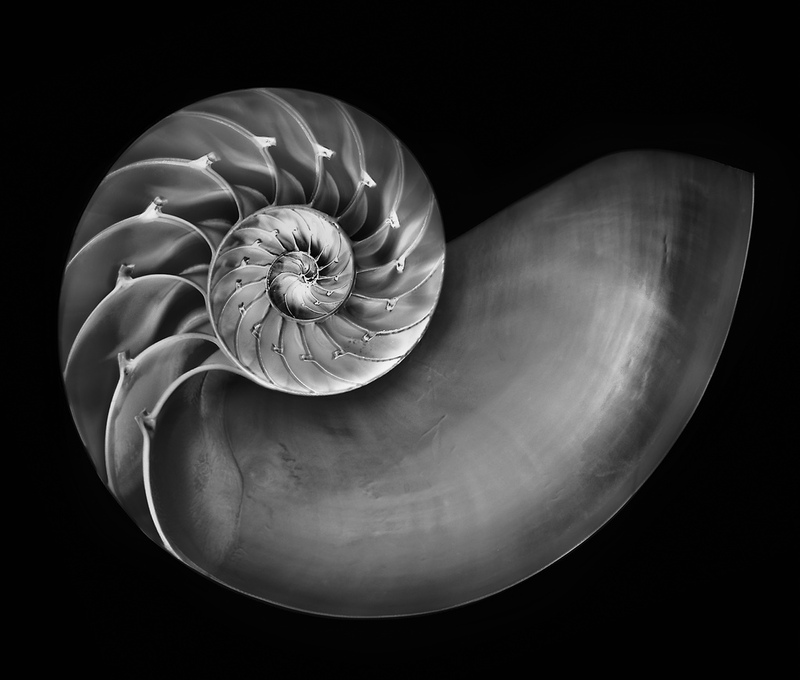 Destan knelt, picked up a tarnished and badly bent candelabra from the ground, and lit the candles with a couple pieces of flint from his pocket. With the candles lit, he could better see the chamber he was now standing in. The room was circular and relatively empty save for a marble pedestal in the center of the room upon which sat small chest and a key. Even with the light the candles now provided, he could not find the origin of the intoxicating rose scent that lingered in the cramped space. The prince slowly approached the pedestal, set down the candelabra and gingerly picked up the box. He noticed strange but decorative etchings of thorns and roses upon the chest’s wooden surface. Raising the box to his nose, he found that the scent of roses seemed to be coming from it. Needless to say, the strong smell was beginning to make him dizzy. Trying his best to ignore the intoxicating scent, he carefully tucked the box under his arm and tried to grab the key only to find that it would not move, as if it were glued to the spot. He pulled at it with all of his might. Slowly the key began to move in accordance with his will, not up, but along the smooth icy surface of the pedestal. Finally he was able to free the key from the pedestal, but it trembled in his grasp and pulled at his hand as if wanting to return to its original place. The prince only held it more tightly, refusing to relinquish his hold on it. This is it. Destan grinned. This is what’s been calling to me! This chest and this key…I wonder what they’re for. He then hurried from the room, eager to get a better look at the two items in the sunlight. Once more, his footsteps echoed loudly, the sound vibrating off the walls, but this time Destan did not care. He was much too excited to worry about anything else. He streamed from the passageway and the moment he did, the stone door slammed shut behind him, the sound making Destan jump. After the shock had worn off and his breaths were no longer coming in pants, he cautiously approached the door to the secret passage once more. He pushed on the door once, twice, and a third time with all of his might, but still it would not budge a single millimeter. The prince sighed heavily, but decided he had gotten what he came there for. His curiosity for this place seemed to have been satisfied for the mean time. He set the box down at his feet and knelt before it, the key in his palm no longer trying to tug itself away from him. He cautiously opened his hand just in case the little metal object was trying to trick him, but relaxed when he saw that the key was once more just an ordinary, inanimate object with no will of its own. Destan grinned excitedly as he tried inserting the key into the lock on the box, only to find that the key was too large for the lock. The prince was baffled to say the least. Why would anyone keep a key with a box that it did not open? The prince took out his pocket watch and sighed when he saw the time. The mysteries of the chest and key would have to wait a bit longer, for his few hours of freedom were almost up. He slipped the key in his pants pocket, wrapped the box inside a tattered piece of drape, and tucked it beneath his arm before heading back up to the palace to prepare for the meeting with his fiancée. For more information and excerpts from The Prince of Prophecy Vol. I: Destined follow this blog and check out the TPoP Facebook Fan Page! A merchant had done good business at the fair; he had sold his wares, and lined his money-bags with gold and silver. Then he wanted to travel homewards, and be in his own house before nightfall. So he packed his trunk with the money on his horse, and rode away. For more fairy tales and information about my new fantasy/adventure novel The Prince of Prophecy Vol. I: Destined follow this blog! Click here to visit my Facebook Fan Page! This is another gem I found at Downtown Disney’s Wonderground. 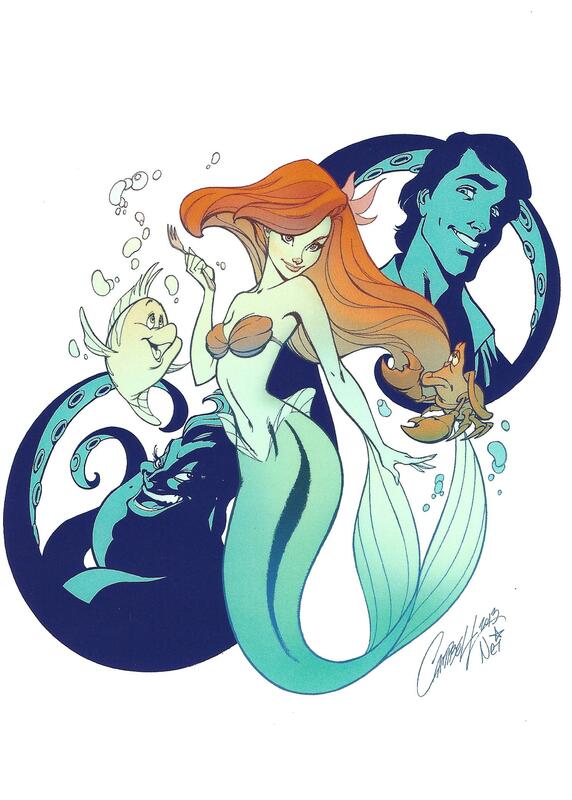 Being a huge HCA fan I could not pass up this “Little Mermaid” postcard. I love these artists! “We’ll soon find that out,” the old Queen thought to herself. Without saying a word about it she went to the bedchamber, stripped back the bedclothes, and put just one pea in the bottom of the bed. 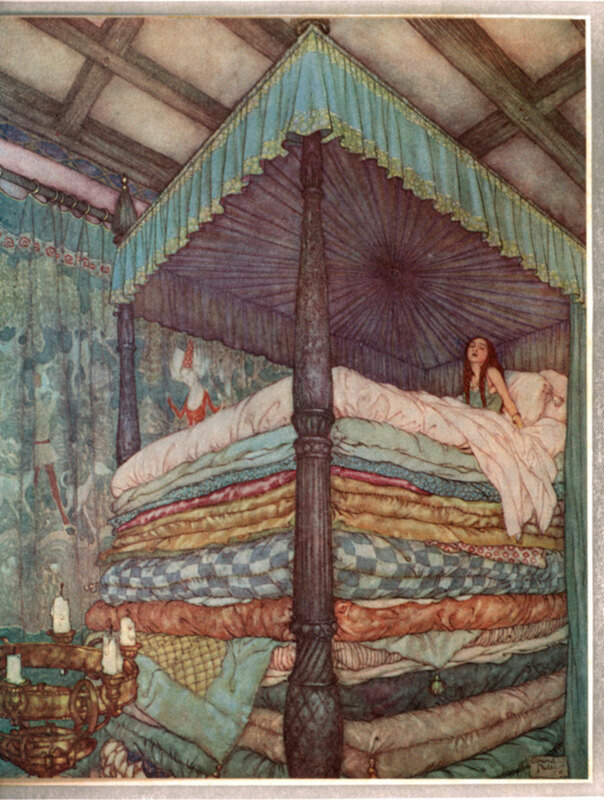 then she took twenty mattresses and piled them on the pea, Then she took twenty eider-down feather beds and piled them on the mattresses. Up on top of all these the Princess was to spend the night. As for the pea, they put it in a museum. There it’s still to be seen, unless somebody has taken it. I don’t know about you, but I like how Andersen ended that one. Forget “happily ever after”, it’s all about “There! Happy?” ha ha! That’s how all stories should end, in my humble opinion. Follow this blog for more original fairy tales and information on my fairy tale/adventure series The Prince of Prophecy. Click here to visit my Facebook Fan Page! “We’ve got a story,” said a freckle-faced teenaged boy who stood just outside the tent. The boy was tall, skinny, and looked to be about a year or so older than Destan. He had dark brown eyes, short, unruly, light brown hair and had patches sewn on his clothes. A girl, maybe a year or so younger than the freckled boy, stood beside him. Her light brown hair was in pigtails and similar dark brown eyes peered out beneath heavy bangs. Destan guessed that the two were brother and sister. The girl also wore simple looking garments which looked to be neatly pressed. The last girl, who stood just behind the boy who had spoken, did not look related to the other two. Of the three she looked the youngest. She had curly dark brown hair which cascaded over her shoulders and was held out of her face with a plain white hair ribbon. Her large eyes were a pretty hazel colour which Destan had never seen before. The prince smiled at the children, but only the girl with the hazel eyes reciprocated his friendly gesture. The mayor, however, frowned and cast the prince an apologetic look before turning his attention back to the children. “We just want to tell our story,” the girl with the pigtails interrupted haughtily. “A gingerbread house…?” Jacob asked sounding a bit more apprehensive towards the idea. “We wandered too far away from our father and when we tried to find our way back to him, we got lost,” Hansel said. “So much for trying to be ‘fine, upstanding citizens’,” Hansel added with a roll of his eyes. “And then we began to eat it,” Gretel said. “You began to eat the house?” Jacob asked with complete disbelief. “Could it have been because you were eating her home?” Destan asked slowly. “But only later did we learn that she was just trying to fatten us up!” Gretel cried, flinging her arms up. “Oh you wish,” Hansel jeered. “I pushed her into the oven!” Hansel interrupted yet again. “It’s not like she was going to need them anymore,” Gretel said almost defensively. “And we eventually found our way back home,” Hansel finished with a firm nod. Want to read more? Follow this blog for updates and excerpts from my awesome new book The Prince of Prophecy Vol. I: Destined — launching this spring! There was once a tailor, who was a quarrelsome fellow, and his wife, who was good, industrious, and pious, never could please him. Whatever she did, he was not satisfied, but grumbled and scolded, and knocked her about and beat her. As the authorities at last heard of it, they had him summoned and put in prison in order to make him better. He was kept for a while on bread and water, and then set free again. He was forced, however, to promise not to beat his wife anymore, but to live with her in peace, and share joy and sorrow with her, as married peopled ought to do. All went on well for a time, but then he fell into his old ways, and was surly and quarrelsome. And because he dared not beat her, he would seize her by the hair and tear it out. The woman escaped from him, and sprang out into the yard, but he ran after her with his yard-measure and scissors, and chased her about, and threw the yard-measure and scissors at her, and whatever else came in his way. When he hit her he laughed, and when he missed her, he stormed and swore. This went on so long that the neighbors came to the wife’s assistance. The tailor was again summoned before the magistrates, and reminded him of his promise. “Dear gentlemen,” said he, “I have kept my word; I have not beaten her, but have shared joy and sorrow with her.” “How can that be,” said the judge, “when she continually brings such heavy complaints against you?” “I have not beaten her, but just because she looked so strange I wanted to comb her hair with my hand; she, however, got away from me, and left me quite spitefully. Then I hurried after her, and in order to bring her back to her duty, I threw at her as a well-meant admonition whatever came readily to hand. I have shared joy and sorrow with her also, for whenever I hit her I was full of joy, and she of sorrow; and if I missed her, then she was joyful, and I sorry.” The judges were not satisfied with this answer, but gave him the reward he deserved. Another fairy tale from the Brothers Grimm. This one was strange, but at least the tailor got what he deserved in the end. Peter Pan is one of my favorite stories, thus when I saw this at Wonderground in Downtown Disney, I had to pick it up. 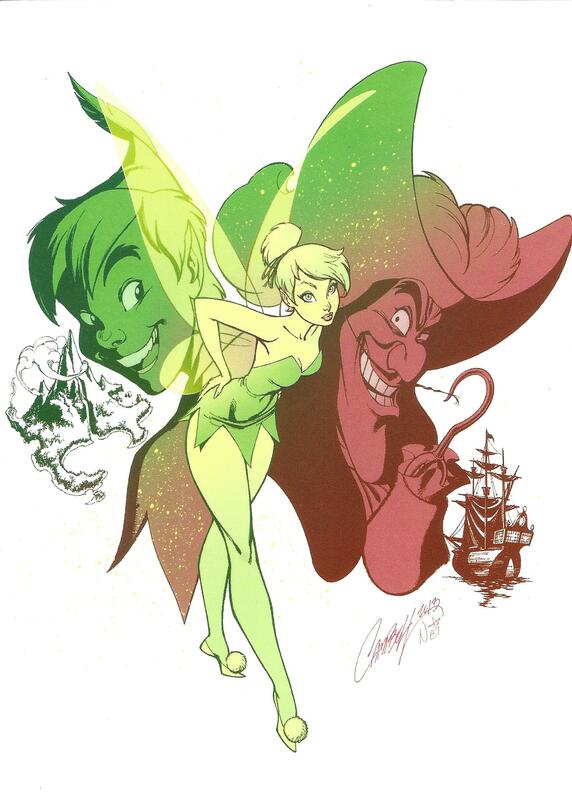 This artwork by J. Scott Campbell and Nei is called “A Pop of Pixie Dust” and I just love how all the characters are drawn! IN the winter time, when deep snow lay on the ground, a poor boy was forced to go out on a sledge to fetch wood. When he had gathered it together, and packed it, he wished, as he was so frozen with cold, not to go home at once, but to light a fire and warm himself a little. So he scraped away the snow, and as he was thus clearing the ground, he found a tiny, golden key. Hereupon he thought that where the key was, the lock must be also, and dug in the ground and found an iron chest. “If the key does but fit!” thought he; “no doubt there are precious things in that little box.” he searched, but no keyhole was there. At last he discovered one, but so small that it was hardly visible. He tried it, and the key fitted it exactly. Then he turned it once round, and now we must wait until he has quite unlocked it and opened the lid, and then we shall learn what wonderful things were lying in that box. The story above was added to the Grimm’s second edition of Kinder und Hausmärchen in 1819. It was placed at the end of the book and for many subsequent volumes it remained the very last tale. It’s quite fitting that a story without an end would conclude a book of folk tales, for, they too, are without end. Want to know what was in the chest? Read my book The Prince of Prophecy Vol. I: Destined when it comes out this spring!